It was yet another day of comparative silence. The only militant activity of the day was reported from Loralia area of Baluchistan, where an officer of Baluchistan Constabulary was shot dead by unidentified militants. The officer was escorting anti-polio campaigners. Although the eyewitnesses said that the shooters were terrorizing anti-polio campaigners, however, Assistant Commissioner Miran Baloch said that it was weapon snatching incident and had no linkages with anti-polio campaign in the area. 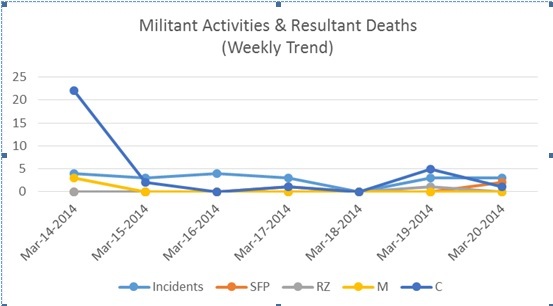 Incident and causality graph has shown a mixed trend during the week though the incidents shown a tendency of substantial reduction. 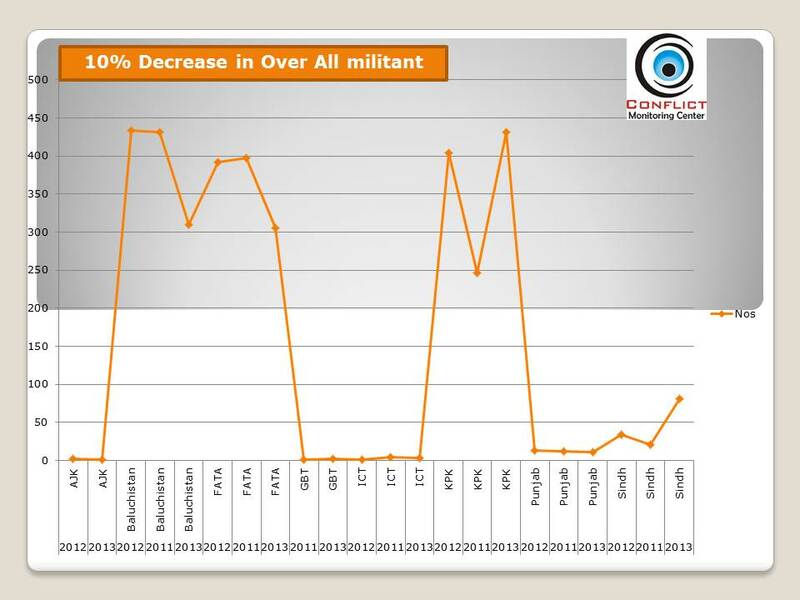 Excluding killing of Baluchistan Constabulary officer on 27 March, deaths among security forces personnel were zero for the last four days. Reacting to a statement of CIA chief John Brennan published in New York Times that Al-Qaeda militants based in Pakistan were relocating to Syria to plan attacks on Europe and the US, the Foreign Office spokesperson Tasneem Aslam said that the US had not provided any intelligence to the government in this regard. Concerning issue of Kashmir, she said that the issue should be resolved through dialogue. She said that unfortunately Pakistan is an election issue in India adding that the trend of leveling allegations against Pakistan from across the border should end. Regarding reported killing of one of the five abducted Iranian guards, she reiterated that kidnapped men were not being held on Pakistani soil. Patron-in-Chief of Pakistan People’s Party Bilawal Bhutto Zardari said that he had received a threat letter from Lashkar-e-Jhangvi (LeJ). In his message on Twitter, he said that in case of an attack he would hold Punjab government responsible. During talks with Government negotiation committee, the Pakistani Taliban have refused to release the abducted sons of Late Punjab Governor Salman Taseer and former Prime Minister Yousuf Raza Gilani. However, they told the government’s committee that they are ready to release Professor Ajmal with a condition that the government would release their two men. 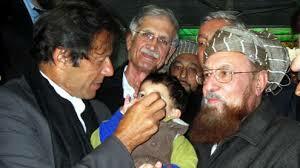 TTP leadership also claimed that the Sindh government is committing atrocities against their prisoners. Taliban peace committee member Professor Ibrahim has said that negotiations between the government and the Taliban are progressing in a positive way. He said that the process of confidence building has begun, adding that they wanted to settle all issues amicably. Member of the Taliban nominated negotiating committee Maulana Samiul Haq said that militant group has demanded the release of up to 400 prisoners. He said that both the government and the Taliban had agreed on taking the mediation process to its logical conclusion and expressed the hope that the process of goodwill gestures would begin soon. PTI chairman Imran Khan said that Pakistani Taliban did not want to enforce Shariah in the country at gunpoint but wanted to liberate it from the US war. He further said that the meeting between the government committee and the TTP Shura had made it apparent which groups were interested in holding dialogue and which were not. He said there was hope of reaching a positive outcome on the dialogue process. He further added that tribal people should have been given priority for inclusion in the government’s committee for peace talks, adding that they held the key to dialogue.